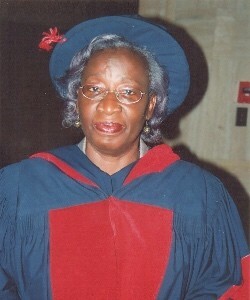 Rose Gana Fomban Leke is presently Professor of Immunology and Parasitology and Head of this Department at the Faculty of Medicine and Biomedical Sciences at the University of Yaounde, Cameroon, and Director of the Biotechnology Centre of the same University. She is chair of the Board of Directors of the National Medical Research Institute, IMPM. She serves on the Scientific Committee and the Ethical Committee of Cameroon’s First Lady’s Research Centre: Centre International de Researche Chantal Biya, CIRCB, in Yaounde. Her research interest is in parasitic infections, particularly malaria. She is Executive Director of the Cameroon Coalition against malaria, and is the Chair of the Multilateral Initiative in Malaria (MIM) secretariat launched on 15 October 2010 at the Biotechnology Centre of the University of Yaounde.